First official state recognition of the value of Torah study as Zionist yeshiva students allowed to continue studies. After two days of voting and debate in the Shaked Committee, chairwoman MK Ayelet Shaked (Jewish Home) has successfully passed a law that will allow students in Zionist yeshivas to continue their studies until age 23. 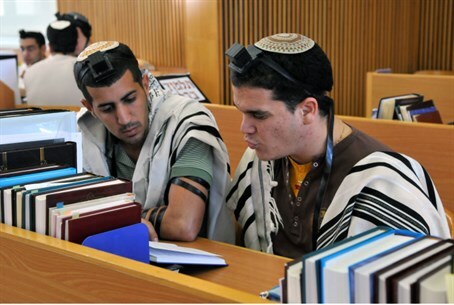 The committee, which is tasked with creating a law on army service for hareidi men, had decided that hareidi men should be allowed to study in yeshiva prior to enlisting in the military, but should be required to enlist by age 21. Many committee members initially said the age-21 cut-off should apply universally, meaning that long-term students in Zionist yeshivas would be required to enlist at the same age. Shaked and others fought that approach. Nearly all students in Zionist yeshivas do eventually enlist, they said, and students at pro-enlistment schools should not be punished for low enlistment rates at other yeshivas. The students in question are learning about the importance of enlistment in yeshiva, and therefore do not need the threat of sanctions to motivate them, they argued. The committee ultimately voted to accept an alternate proposal according to which students at Zionist yeshivas will be allowed to delay enlistment until age 23. A select group of 300 students will be allowed to postpone enlistment until age 26. The vote indicated a significant change in the committee’s position, and marks the first time that authorities have officially recognized the importance of Torah study. A similar arrangement was proposed for hareidi yeshivas as well, despite the fact that hareidi yeshivas do not encourage students to enlist in the military. However, hareidi representatives rejected the proposal, which would have included a commitment for all students to eventually enlist.